We’re a couple of weeks into 2011 now, so take a moment to reassess. Have you lived the last two weeks like you’d like to live this year? For example, have you spent as much time enjoying nature (shoveling snow may or may not count depending on your attitude!) as you should? As all great coaches say, “You play like you practice.” If you want to win big during spring migration, get your reps in now! Where exactly will you be this weekend and how will you fit in bird watching? Share your plans in the comments below! I’m hoping to find a stray Bohemian Waxwing in the Rochester area this weekend, assuming the temperatures exceed single digits. Corey will be birding in upstate NY while visiting his folks, hoping for birds he can’t see in NYC. 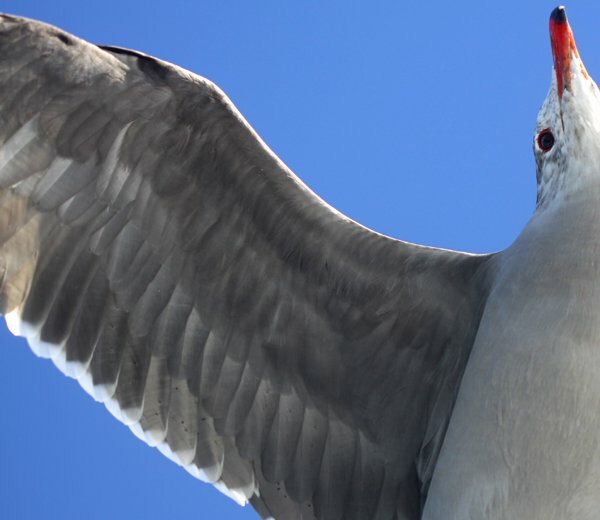 Look up in the sky… it’s a (Heermann’s) gull! Wow, what a nice makro shot, Very sharp en nice compo, Well done! Wow!! That is so cool! I have never seen a flight photo to compare with it!!! I love seeing the sun through the feathers!!! Wow, great shot. Since I watched a Harrier tear feathers from its kill a few hundred feet from my door yesterday, I think I’ll just stay home and do my birding. How much better can it be? For me, now, the “luckiest” place…..right in my own backyard. Yahoo. I have lived on this 6-8 mile-long lake for nearly two years. And while I saw many, many water and non-water birds, I could not lure any of the songbirds to my feeders. Now, on a given day, I have 30-40 Mourning Doves here under the feeders on the ground, 6-7 Cardinals, 20+ Juncos, so many different kinds of Sparrows, several species of Woodpeckers, Flickers, and my illusive Big-Honkin’ Pileated that flies threw from time to time. I have cute, little, timid Chickadees. Lately, Yellow-winged Grackle-crosses have showed up and mostly place nice with the others. And, I have a “Mystery” bird. I now think it is an American Goldfinch in it’s winter plume….not sure though, but it’s wing stripes match nothing else. Now, they are only barely greenish-shellow on their heads. of the wing, while the bottom stripe is very short. I will try to post a photo – my computer tanked with all my photo software, but, I was hoping someone out there in birding-land might just already know, just from my description….we can hope, can’t we, ha? Up close and personal..that’s the way to be when admiring Nature! Great shot!I’m in sunny Arizona and birding is famulous..all I need is the one GREAT photo..I’m chasing the hummingbirds..maybe I’ll capture the photo this weekend! Wow – great shot! Wonderful perspective! Started by hitting a couple of city parks in Tucson this morning, then co-leading two tours in the Sulphur Springs Valley for the Wings Over Willcox festival. Should be birdicious. Another backyard birder here, only my “backyard” will by Brooklyn’s Prospect Park. Reports over the last snow-filled week have tallied about 45 species there, including a trio of Black vultures overhead yesterday. Fullersburg Woods, west of Chicago. 20 degrees, but a bird-filled day nonetheless. The red-bellied woodpeckers were busy working on their spring nest holes (wood bits flying, amidst the hammering), lots of downy woodpeckers too, as well as chicakadees and nuthatches, cedar waxwings, yellow-rumps, ducks and geese in the creek, cardinals, blue jays, robins and starlings, juncos, and my personal favorite – if such is allowed – a generous amount of time with a fabulous brown creeper.